BANGI, 30 December 2014 – The movement that is waging war in Syria and Iraq known as Islamic state (IS) is deviating from the true concept of Jihad. This was the view of two Islamic scholars Prof Dr Badlihisham Mohd Nasir from Universiti Teknologi Malaysia (UTM) and Dr Muhamad Adib Samsudin from UKM and a Muslim missionary Nazmi Abdul Karim fromMuslim Care. 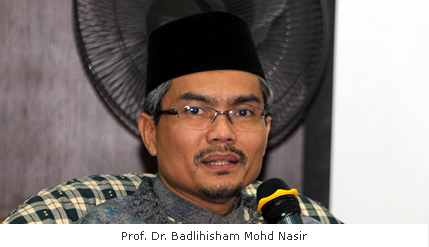 Speaking at a forum on Jihad, Martyrdom and Terrorism: Between Theory and Realityorganised by the Islamic Centre of The National University of Malaysia (UKM) recently, Prof Badlihisham said IS had been targeting gullible youths and students wanting to fight but were not well-versed in the concept of Jihad, or holy war. He said there are other legitimate Islamic bodies such as Islamic Movement, that are committed to fighting a holy war. They agreed that Jihad is war in Allah’s way to uphold Islam to fight infidels who are against Islam. They said Islamic Jihad has legitimate standing and is obligatory in the battle against the enemies of Islam. Dr Muhamad Adib said jihad is a top priority struggle for those who believe in Islam and have knowledge about Jihad. Death in the name of Allah is something greater than the treasures of the world. He also shed light on the differences in circumstances making Jihad compulsory or voluntary. Dr Muhammad Adib said if a country is not attacked and where there is no declaration of war then the jihad is voluntary. However, if the country is attacked by an enemy of Islam then Jihad becomes obligatory where each individual Muslim is required to fight against the enemy. Nazmi recounted his experiences in Syria recently where atrocities had been inflicted on many Syrians including children.